Domestic violence is firmly on the local agenda this week as Northern Ireland’s most influential leaders from the legal, prosecution, law enforcement and frontline support sectors gather for the start of the first ever Justice Institute on Gender-Based Violence to be held in the UK. The internationally-led event which is taking place in direct response to the domestic violence problem sweeping Northern Ireland with the Police Service of Northern Ireland (PSNI) responding to a domestic violence incident every 18 minutes of every day, a quarter of all murders in the region in 2016/7 related to domestic issues and domestic violence generally at a ten-year high. Funded by the Avon Foundation for Women, the Justice Institute on Gender-Based Violence is an innovative and interactive training programme that provides participants with the tools needed to better identify, investigate and prosecute gender-based violent crimes. The event which is taking place in The Merchant Hotel (27th February – 1st March) is being run by the Washington DC-based Vital Voices Global Partnership and the US Department of State, with experts flying in to bring their specialist knowledge to over 50 representatives from the PSNI, the Public Prosecution Office, criminal and civil justice workers, lawyers, and frontline workers. 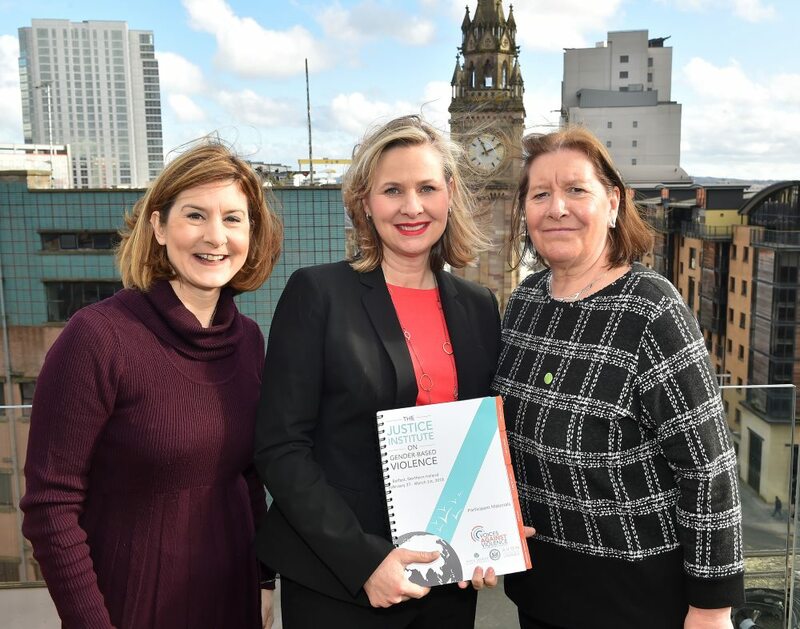 In bringing the Belfast event to fruition, the Vital Voices Global Partnership has been supported on the ground by the Belfast Area Domestic and Sexual Violence Partnership which comprises of the agencies, organisations and groups working locally in improving services and support for victims of domestic violence and abuse. Christine Jaworsky, Director, Avon Foundation for Women, said: “Belfast was identified as uniquely well-suited to benefit from a Justice Institute not only due to its unique history of conflict and the impact of this on intimate partner violence but also due to its network of dedicated advocates working tirelessly to support survivors of violence. Since 2014 17 Justice Institute events have taken place in 10 countries with high rates of domestic violence, including Argentina, Brazil, Chile, Colombia, India, Mexico, Nepal, the Philippines, Romania and South Africa. The launch of the Justice Institute took place today. Avon is the company that for 130 years has proudly supported beauty, innovation, optimism, but above all women. Avon products include recognized and appreciated brands such as ANEW, Avon Color, Avon Care, Skin so Soft, and Advance Techniques, sold by nearly 6 million active and independent Avon Representatives. Learn more about Avon and its products at www.avoncompany.com . In 1997, Vital Voices was created to make space for women to be heard. Our founders knew then what has now become a universal truth: that women are essential to progress in their communities. Our world cannot move forward without their full participation. Today, Vital Voices organization is the product of the women we have worked with, their insights into leadership and our changing world. Vital Voices invests in leaders because they take the responsibility to improve societies. They strengthen laws, create jobs and defend political freedoms. Our investment in one leader impacts hundreds and thousands more. We partner with women who demonstrate leadership that unites and inspires people. They exhibit visionary thinking and take risks to innovate. Each leader in our global network believes in mentoring the rising generation and shares her knowledge, experience and influence with others. A public-private partnership led by a Consortium, including Vital Voices, Promundo, IOM and the Global Fund for Women, and funded with support from the Department of State and the Avon Foundation. The Voices Against Violence Initiative aims to ensure that victims and survivors of gender-based violence (GBV) and harmful traditional practices around the world have better access to services, protection, and the justice they deserve.